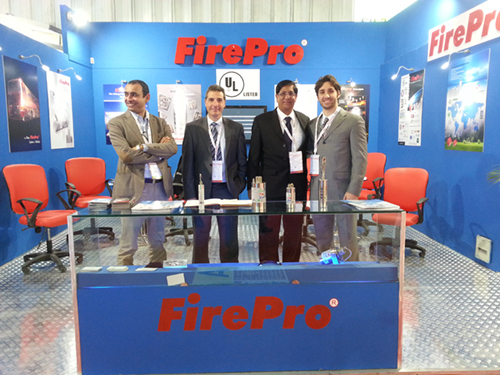 ELECRAMA FirePro Systems made its inaugural presence, at ELECRAMA 2014 - one of the biggest exhibitions in India. It took place at the BIEC exhibition centre in Bangalore between 8th and 12th January. The 11th Elecrama 2014 - International Exhibition of Electrical & Industrial Electronics Industry, hosted 805 exhibitors from india and 165 from other 25 countries provided globally comparable event experience and ambience at one of India'smain exhibition venues. ELECRAMA 2014 was supported by the Ministry of Power, Ministry of Power, Ministry of Heavy Industries & Public Enterprises and Ministry of COmmerce & Industry, Goverment of India. Summing up, the event was an overwhelming success for our company and its products. Many thanks to those who visited us and we look forward to starting and or continuing doing business with you.